The New Zealand tea tree (Leptospermum scoparium) is an evergreen shrub (or small tree) that features white, pink or red blossoms. The scientific name associated with this shrub is Leptospermum scoparium and it is included within the Myrtaceae (myrtle) family. 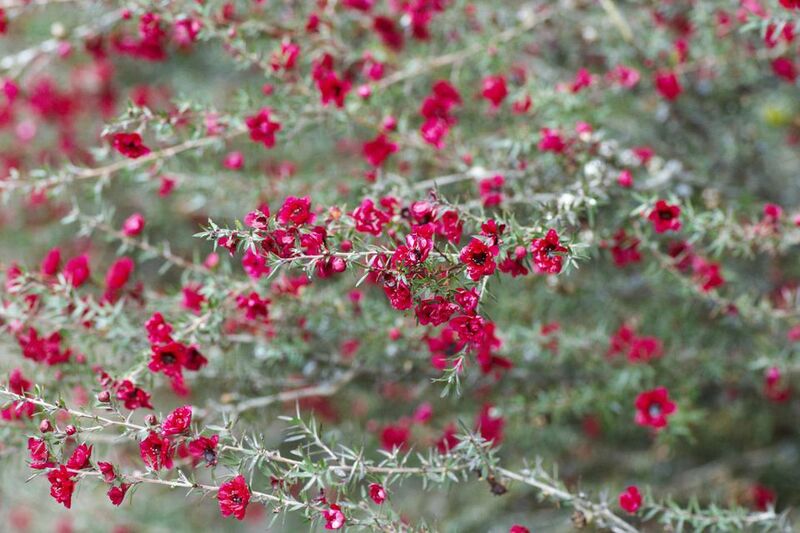 The name Leptospermum lets you know that this has thin (Lepto-) leaves (-spermum). A synonym for this species is Kunzea scoparium. In addition to New Zealand tea tree, you may also see the names mānuka, tea tree, wild alpine manuka, New Zealand tea bush, manuka myrtle, broom teatree and New Zealand teatree used for this shrub. When Captain Cook was exploring Australia and New Zealand he made tea from the leaves on this plant to ward off scurvy, which is the inspiration for these common names. This plant is best grown in USDA Zones 9 to 10. It is native to Australia and later became naturalized in New Zealand. This shrub will be anywhere from 2 to 20 feet tall and wide depending on the cultivar chosen and growing site. Find a location that offers full sun to partial shade. Flowering will be better if the plant is situated in a full sun spot. The leaves are acicular and are sharply pointed. Each one is under 1 inch long. They are fragrant when smashed. Red, white or pink cup-shaped flowers are borne all over the shrub each year. Cultivars like 'Apple Blossom' and 'Ruby Glow' produce double flowers. The fruit is a small grey capsule that holds many tiny seeds. If you like the look of the New Zealand tea tree but need a smaller shrub, look for the 'Nanum', 'Horizontalis', 'Kiwi' and 'Snow White' cultivars. As you might guess from the name, 'Snow White' features white blossoms. Several shrubs could be used to form a privacy barrier since they bear sharp leaves. The New Zealand tea tree is considered to be an invasive shrub in the state of Hawaii. Invite bees to your garden to aid in pollination by planting this shrub. You can create new plants through the use of seed germination and taking cuttings. If you live in a cooler USDA zone, you can still have this plant in your garden. Simply plant it in a container and bring it in each winter, making sure to harden it off to ward off shock. There is usually not much pruning needed unless some part has become dead, damaged, or diseased. You can trim a little each year once the flowers are done to help keep it in check. They can be shaped to form a bonsai. You may see webbing caterpillars, borers, and scales on this plant. An infestation of scales can lead to problems with honeydew and sooty mold. Root rot may set in if the soil does not drain well. According to our Holistic Healing Expert, Phylameana lila Desy, honey made from the nectar of this shrub (called manuka honey) is a part of honeybee therapy and can be used to treat infections like MRSA. Though this has tea tree in the name, this is not the source of the tea tree oil used in alternative medicine. That product comes from the narrow-leaved tea tree (Melaleuca alternifolia) which is an Australian native that is also in the Myrtaceae family but in a different genus. The leaves of that species can also be made into a healthy drink. Note: The preceding section is for educational purposes only and is not meant to be medical advice. Check with your preferred health professional before taking parts of the New Zealand tea tree for medicinal reasons.